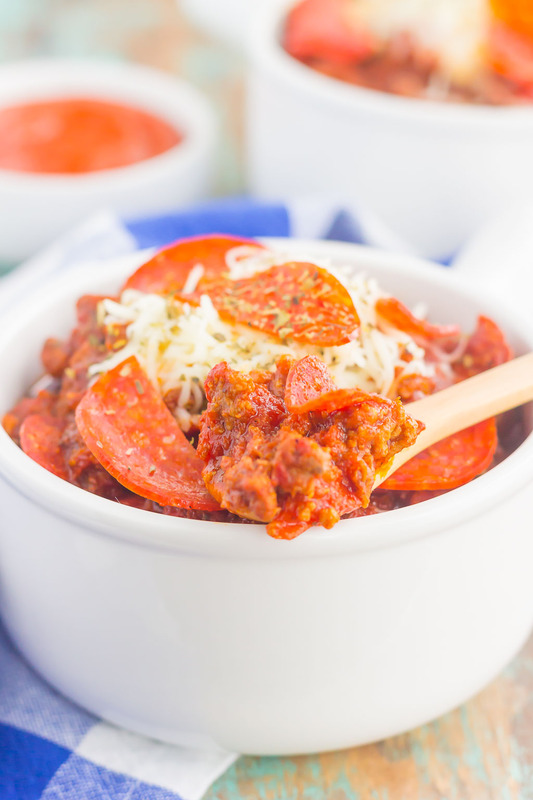 This Slow Cooker Pizza Chili is loaded with ground beef, Italian sausage, pepperoni, and zesty spices. It’s a fun twist on a classic comfort dish that will keep you coming back for more! Well, friends…we made it to mid-January. We’re officially halfway through the month and I couldn’t be more excited. Out with winter and in with spring! Wishful thinking, I know…. 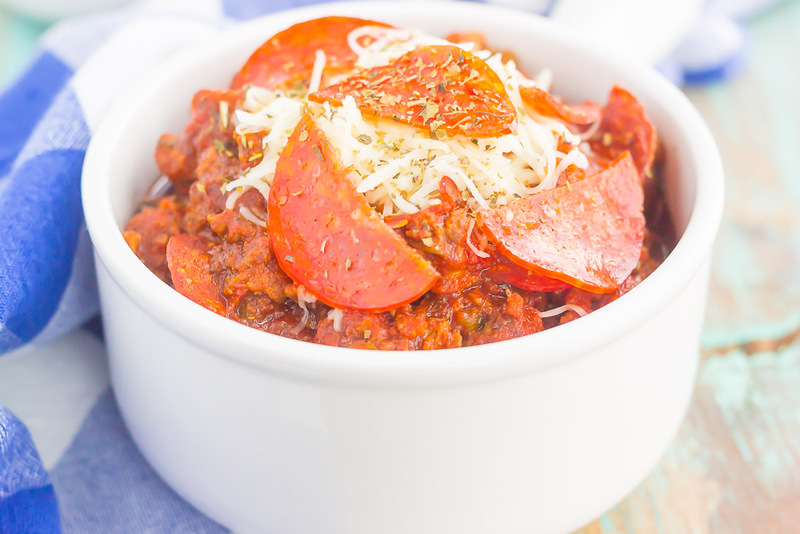 But, I’m trying to stay positive, so I think we should welcome the month with a big pot of this Slow Cooker Pizza Chili! Chili is one of my all-time favorite comfort foods. And I know that many of you love it, too! In fact, this Slow Cooker Hearty No-Bean Chili is one of my most popular recipes around here, which just screams all sorts of wonderful deliciousness. And since the cold weather is not showing signs of stopping anytime soon, I thought we could all use some comfort food. If you’re a fan of chili, then you can bet this pizza chili will wow your tastebuds. It’s easy to make, packed with flavor, and resembles pepperoni pizza, in chili form. And on a cold day, what could be better? 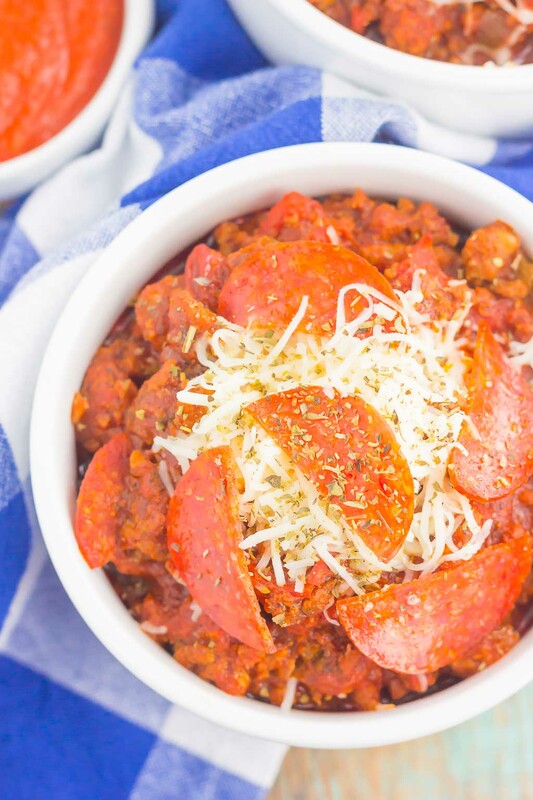 What sets this Slow Cooker Pizza Chili apart from the rest is that the sauce is a mixture of regular tomato sauce, diced tomatoes, and pizza sauce. 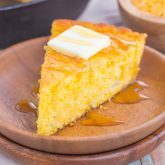 It makes this dish a touch lighter, and a little bit sweeter, too. And let’s not forget about the pepperoni! I used an entire packaged of halved pepperoni slices to give this chili that authentic pizza flavor, along with some zesty seasonings. I chose to leave the beans out, as the hubster doesn’t like them, but you could always add a can of kidney and/or pinto beans to this dish. And like most of my recipes, this chili is a breeze to whip up. But, you knew that was coming, right? Simply brown and crumble some ground beef and Italian sausage in a large skillet, and then pop it into the slow cooker, along with the rest of the ingredients. Easy peasy and oh-so delicious! 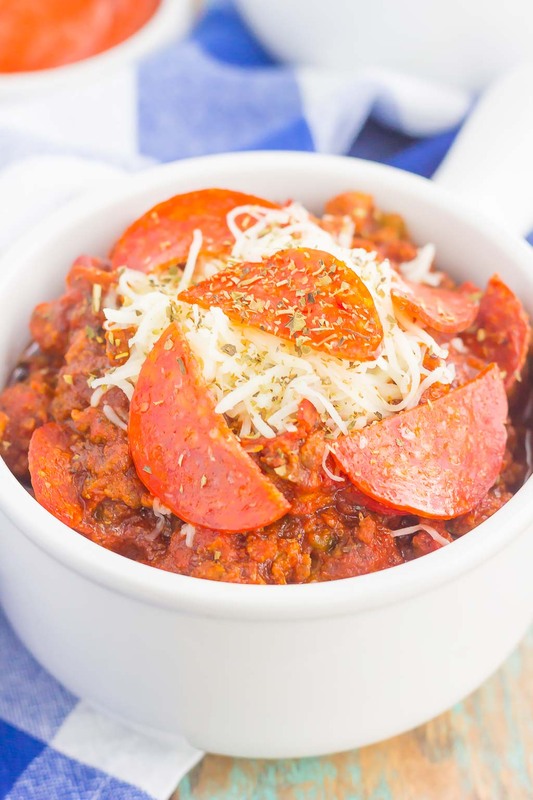 My favorite thing about this Slow Cooker Pizza Chili (besides the comforting taste, of course) is the smell that wafts through your house as this is simmering. It’s warm, hearty, and filled with flavor. Serve up a big bowl of this chili, along with a topping of mozzarella cheese and a dash of Italian seasoning. You’ll love the cozy pizza flavor and delicious taste! 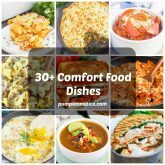 Looking for more slow cooker favorites? I’ve got you covered! 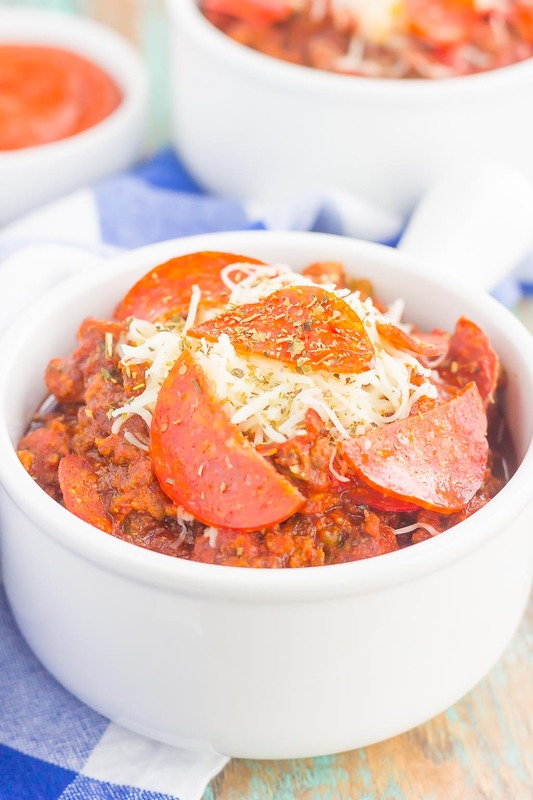 This Slow Cooker Pizza Chili is loaded with ground beef, Italian sausage, pepperoni, and zesty spices. It's a fun twist on a classic comfort dish that will keep you coming back for more! In a large skillet, brown and crumble ground beef and Italian sausage until cooked through. Drain and add to slow cooker. Add pepperoni slices, pizza sauce, tomato sauce, diced tomatoes, tomato paste, onion, green pepper, chili powder, minced garlic, cayenne pepper, cumin, oregano, sugar, and black pepper to slow cooker. Serve with shredded mozzarella cheese and a dash of Italian seasoning and/or sour cream, if desired. A can of kidney and/or pinto beans can be added to this dish. If desired, once chili is done cooking, sprinkle shredded cheese over chili while still in the slow cooker and cover for 5-10 minutes, or until cheese is melted. Thanks, Dawn! Chili is perfect for the slow cooker. Anything that's pizza-flavored gets the stamp of approval in our house! I love this mash-up -- especially because it can be made in the slow cooker. PERFECT! Love both pizza and chili and can't wait to try this recipe! My family will love it! Pinned! Thanks, Mira! It's a great combination! I can't believe that January is half over already either! I can't believe haven't had chili since before the holidays and need to change that. 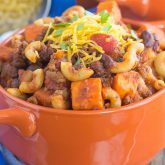 This pizza chili sounds amazing Gayle -- my meat loving boys would be especially crazy about this! 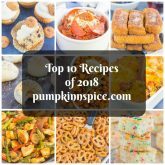 I love that it can be made in the slow cooker too! Isn't this month flying by? Thanks for the chili love, friend! sounds so comforting! can never have enough of chili! Me either! Chili is the best! haha I am loving this January since we've actually gotten real snow this year!! A rarity where we live :) ANYWAY - this is such a fun spin on chili! Can you even go wrong with pizza!? I think not. Thanks for the chili love, Ashley!